If you’re after pure and unadulterated indulgence, Själ is an excellent choice. This luxury lifestyle skincare line merges a holistic approach (the products are infused with precious minerals and gemstones) and scientific advances, bridging ancient eastern medicines with the latest in western biotechnology. 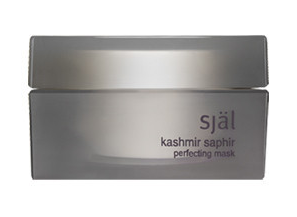 I tried the amazing Själ Kashmir Saphir Perfecting Mask, as I felt that my skin needed a bit of a boost in this ever-changing weather, and I wasn’t disappointed. The mask is a pale blue, feels very soft on application, and I was surprised at how little I needed to use on my face. It smells slightly minty and refreshing and feels cool to the touch. The results are really outstanding, I put it on half of my face to start with – to be able to compare both sides – and after just 60 seconds they felt completely different: on side was silky smooth while the other one felt much coarser. The list of ingredients is pretty spectacular too: it contains silver for its anti-microbial and anti-bacterial properties, gold and platinum for tissue and cellular regeneration, blue sapphire for clearing, blue copper for lifting and bio-nutrient minerals for pore minimization. It also contains Chinese herbs. Whether it was the herbs, the gold or the platinum or perhaps the combination of them all I’ll never know, but one thing I can say is that it’s an incredible mask that once you try, I’m sure you’ll cherish and love as much as I did. Long term results include firming and pore minimizing as well as calming and evening out your skin tone whilst increasing oxygen uptake. All in all a great boost for your skin and the perfect alternative to a facial. For more information go to Beautyworkswest.com. Priced at £124.00 for 60ml. This entry was posted in Skincare, Wellbeing and tagged Blue Saphire, Chinese herbs, face, Hydration, indulge, luxury, perfecting mask, Själ Kashmir Saphir Perfecting Mask. Bookmark the permalink.